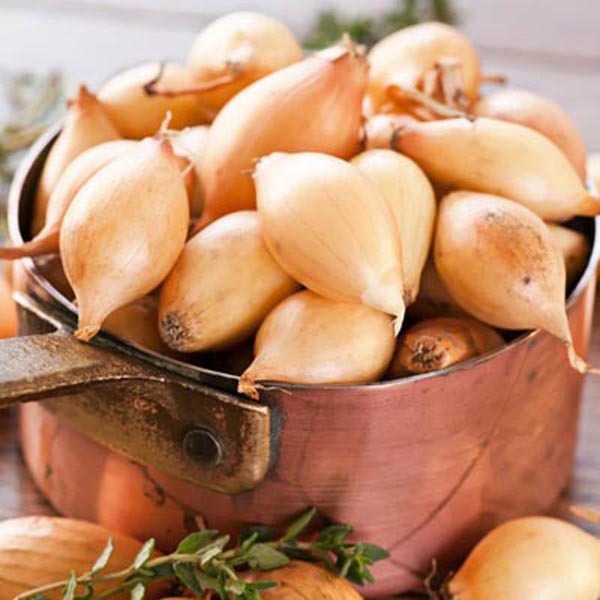 Shallots are related to onions and have similar culinary uses, but their flavor can be described as more like a sweet onion with a hint of garlic. Produces copper-skinned, tapered bulbs in clusters. If shallots are planted in spring, then harvest as soon as the foliage start to yellow and die back in the late summer or fall. Bulbs planted in the fall in areas with moderate winters can be harvested in the spring. Shake dirt off the bulbs and allow to dry for about a week before storing in a cool, dry place. A mesh bag works well for storing all types of bulbs. Plant in a reliably sunny spot. Best in fertile, well-drained soil. Keep soil moist, watering freely in dry weather. Harvest when tops brown, and allow to dry in the shade.